Even if you aren’t a whisky drinker I am certain that you’ve heard of The Glenlivet. It’s a classic, very well known brand that in my opinion new/first-time whisky drinkers first gravitate towards. No, this is not the first time I’ve written about The Glenlivet, but it is the first time I am posting about the 12 year-old in their range. To be honest, this weekend was the first time I tasted this 12 year-old. My friend Dan gave this bottle to me as Christmas gift. Dan felt I needed an everyday whisky, which is why he got me this 12 year-old for my collection. The bottle was a part of a box set that also included a mini of the 15 year-old and a mini of the 18 year-old. I have not tasted the 18 year-old before so I am looking forward to tasting it and writing about it. This Speyside distillery was founded in 1824 and is now owned by Pernod Ricard. You can read my other Glenlivet posts at the following links: The Glenlivet 15-year-old French Oak Reserve; The Glenlivet Nadurra 16 year old Cask Strength; Glenlivet 21 year-old Archive. From their range my favorite so far has been their 21 year-old Archive. That did not change after tasting the 12 year-old however, I was pleasantly surprised on the smoothness and taste of this young whisky. I actually prefer it to the 15 year-old. This whisky is definitely an everyday whisky. There’s no complexity to it, but it tastes good and is affordable with a low cost of $30-$45. I would take this 12 year-old over the 15 year-old any day. I can see why this would be a good brand to start with if you’ve never had whisky before. 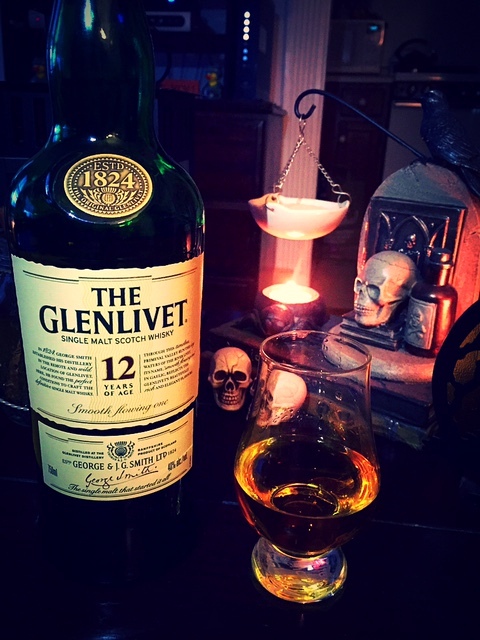 The Glenlivet 12 year is a quality brand that tastes good and is affordable. A win win! Sadly the Glenlivet 12 Years Old is being discontinued in many markets and replaced by their no-age statement Glenlivet Founder’s Reserve – If you like the 12 Years Old, now may be a good time to stock up on a bottle or two. I was not aware of this! Thanks for letting me know. It’s sad to hear they are doing this.